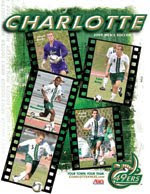 The Charlotte 49ers men’s soccer team (2-1-1), which is currently ranked No. 1 in the NSCAA Mid-Atlantic region, will host the Charlotte Nike Invitational this weekend at Transamerica Field. The 49ers face Cal State Bakersfield, the alma mater of 49ers head coach Jeremy Gunn and assistant coach Kyle Gookins, in their first game of the Invitational at 7:30 p.m. Friday. Winthrop will play Appalachian State at 2:30 p.m. Friday. On Sunday, Cal State Bakersfield will face Appalachian State at 11 a.m. and Charlotte will host Winthrop at 7 p.m.
“The team is playing well and should enter the weekend brimming with confidence. The players have shown great mental toughness over the season so far - and I am sure they are ready for two very strong opponents," Gunn said. Gunn, who was a 1992 NSCAA All-American, played at Cal State Bakersfield from 1989 to 1992. He finished his collegiate career with 46 goals, 36 assists for 128 points. Gookins played at Bakersfield from 2000 to 2003. Charlotte sophomore Evan James and seniors Adam Gross and Luke Exley are currently tied for the team lead in goals with two apiece. James leads the 49ers in assists with three. The 49ers have won their last three home games. Admission to Friday’s games is $5 for adults and $2 for youth (17-and-under). Admission to Sunday’s game is $5 for adults and youth (17-and-under) are free. Charlotte 49ers students with a valid student ID are admitted free.